Lorna Bevan – The big shift -literally! -this week is Jupiter slowing to turn retrograde on Wednesday April 10th at 24 Sagittarius. Between now and August, as the biggest planet in our solar system takes you on an archaeological dig to recover lost treasure between the Galactic Centre and the Great Attractor, if you collaborate by picking up clues, journaling your dreams and trusting your inner guidance, you will gradually constellate more spaciousness, more options, more light of wisdom by re-igniting the flickering spark of hope. Sagittarius Key Words: far horizons; questing; seeking; visioneering; future oriented; philosophical; meaning seeking. Until December 3rd 2019 Jupiter the Hierophant in mutable fiery Sagittarius is on home territory. The gift of Sagittarian centauric consciousness is the ability to hold both rational thought (Mind) and intuitive awareness (Soma) in your connection to the unified Field that lies beyond what you perceive – the world behind the world. Framed in chaos theory, you have reached a choice point somewhere between your usual comfort zone and infinity. The task now is to balance living between Structure – supportive routines – and Surprise – the spontaneous, unplanned and mysterial. Start now by deliberately attracting new people, new ideas and new encounters into your life by sensing and seizing emerging flickers of possibility. Jupiter is often described as bringing luck but luck is created when you’re willing to take risks, follow your hunches and take every opportunity to expand your world. “We revere an essence of the Feminine which we can restore to life as we unite within its sacred precincts. Only as we uncover Her in our midst do we realize why we are here and how we can tap the mystery and the magic of this earthly existence in great abundance and generosity. We are poised here on the edge between the contemplative and the active worlds. First, we are drawn within, to become able to honor what the culture has forgotten and what we ourselves have virtually done away with. A journey, a process, a steep arduous passage is usually involved. We have lost and forgotten so much and we have turned ourselves almost numb to the very treasures we bear within. This is the kind of sacred mystery that wants to become open, free, spilled out everywhere. On April 10th Jupiter turns backwards in a square with Neptune, Venus, Mercury + a trine to the Sun/Eris/Uranus + the Node of Fate. The message is clear: this is Dream Time – but active dream time. Last Friday’s New Moon in Aries-marking your personal New Year- should be lifting your spirits, making you feel more at home in your own skin and boosting your confidence, which has taken some knocks in recent months. On Wednesday expansionist Jupiter turns backwards until August in your 9th House of study, travel and philosophy. It’s time to go on a quest-both inner and outer- to explore wider horizons and to shake off the limitations you’ve allowed to keep you stuck. How you engage with this doesn’t matter-the important thing is to realize that your way of seeing the world, your knowledge, your old maps are ripe for new input. If you think you know all you need to know about yourself, prepare to be surprised. Reclaim and re-ignite an old passion that you left behind. The Sun is hidden deep in your 12th House-the engine room of your chart-until the Full Moon on April 19th and your energy levels are lower than usual. That said, planet of surprises Uranus now in Taurus is in a helpful alliance with expansionist Jupiter in your zone of finances and resources. On Wednesday, Jupiter turns backwards there until August offering you an opportunity to go right back to essentials. What is bringing results? Where are you giving your work away for free? How are you underestimating your gifts and services? What applicable resources -skills, talents, life experience-could you re-package to add value for others in a new, more creative way in keeping with who you are now? Are you feeling the Mars effect yet? The red planet is delivering a boost of energy, drive and momentum as he travels through your sign for the first time in two years, much needed after recent months. 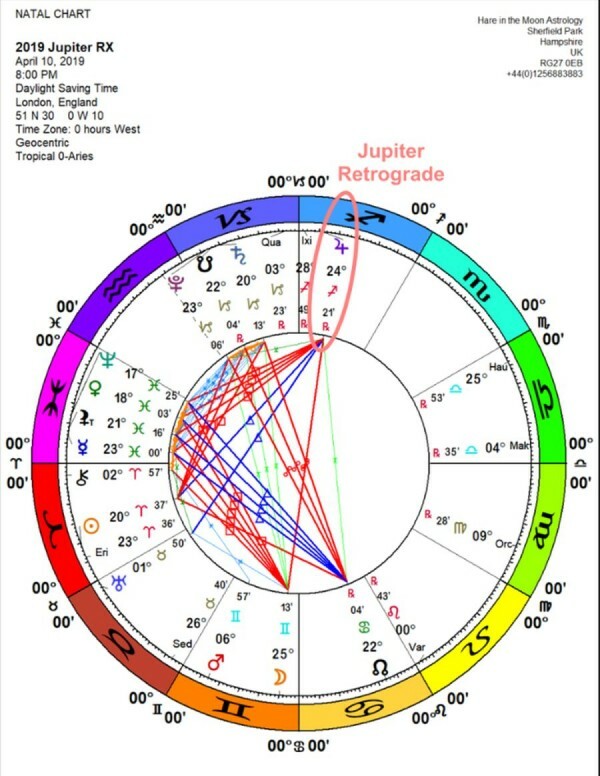 Not only that but Jupiter is turning backwards on Wednesday until August in your opposite sign bringing opportunities to develop more independence, sovereignty and self-agency by making choices that reflect a new approach to risk taking. Expect to start re-balancing relationship dynamics -both personal and professional -to reflect how you see yourself now. This might bring a changing of the guard in terms of friendships and, if so, welcome it as clearing the way for healthier, more rewarding alliances. There’s an emerging trend in your solar astrology towards greater expansion and integration. Until recently, much of your focus has been on firefighting career crises, sidestepping power plays or simply trying to survive radical changes outside your control at work. You’ve made some important decisions and taken some risks which the old you would never have contemplated. Now, as the archetype of wisdom and evolution Jupiter turns backwards in your zone of service until August, you are pulled to offer your gifts and services in new ways. Far less compartmentalizing your work/life and much more following a way of life with heart and purpose. Consider how you could add teaching, mentoring or coaching into your repertoire in some form. What do you know that could add value to others? It doesn’t have to mean a drastic career change but simply adding another income stream. Time to stop undervaluing yourself. It’s a week of changing energy patterns and cross currents as Jupiter- the biggest planet in our solar system- slows to turn backwards in fellow fire sign Sagittarius. For you as a Leo, the gift in this is time to take a big picture look at how, where and why you’re investing your energy and creativity. This will be a recurring theme between now and August. It’s all to easy just to keep on following old goals and dreams without pausing to ask:” Does this- insert path/job, hobby, life direction- really reflect who I am today or have I outgrown this?” There’s no rush. As Jupiter moves backwards, old, neglected or forgotten passions and interests will resurface. When they do, don’t brush hem aside thinking you’ve outgrown them-but take a closer look to see if there is something inspiring to re-ignite. Expect a week of push-pull as Jupiter turns retrograde at the base of your chart while Venus merges with Neptune in your opposite sign. Your home, family and sense of belonging have been supported and enhanced by expansionist Jupiter since last November but from Wednesday, it’s time to take a closer look at what’s stuck, what needs an upgrade and where to make a leap of faith. One close relationship will cast either a rosy glow or start to dissolve in front of your eyes. The trick in all of this is to look a little deeper, ask some searching questions and get to the heart of who and what really matters to you. A fairy tale or an illusion? This week with your personal ruler merging with dreamer Neptune you might be tempted to look at life through rose tinted glasses. Not a good idea. Take them off, all the better to see things more clearly. With the feisty Sun in Aries at odds with eliminators Saturn and Pluto across the angles-the foundations of your chart- there could be unexpected clashes with important partners either personal or professional. Be at your most diplomatic whilst drawing a line in the sand that you refuse to cross and keep in mind that there will be definite endings and new beginnings at the second Full Moon in your sign on April 19th. Frame the next week through to a doozy of a Full Moon on April 19th as giving you time to prepare for much faster moving events when the Sun hits unpredictable Uranus in your opposite sign. That doesn’t mean you can just sit back and watch the world go by but that strengthening your foundations should be a high priority. On Wednesday 10th, expansionist Jupiter turns backwards in your zone of income and resources until August just before the Sun has a standoff with implacable Pluto in your angle of communication. There might be a power play around one source of income or debt repayment or a challenge that means you have to draw on reserves. The message is to look at the big picture, then overhaul and upgrade and future proof your finances. The big event this week is your personal ruler Jupiter slowing then turning backwards in Sagittarius. Ever since last November, you have had Jupiter’s extra protection and support as well as the gift of new opportunities that could expand your world. If you’ve started a course of study, traveled to far off places or taken a leap of faith, you are right on track. Now you get the chance to take a look at the big picture, to check your co-ordinates and make a course correction, if necessary. It’s likely that the deeper purpose behind your recent decisions will come to light, re-igniting your enthusiasm for your quest. And, with reality planets Saturn and Pluto in the frame, make sure that the finances to support your adventures are signed, sealed and delivered. Your home and family are in the spotlight now as the Sun at the very base of your chart is at odds with reality planets Saturn and Pluto in your own sign. It seems as if the time has arrived to decide if a way of life has come to an end-outlived its purpose- and look for ways to leave the traditional way of doing things behind in favor of a change of direction. Don’t hide your head in the sand but look squarely at close relationships, where you live, how you live and how much you’re investing in it. Those close to you will also welcome a breath of fresh air in what has become routine and stale so get them on board from the beginning. Decision time is around April 19th at the Full Moon across your work/life angle. With Venus merging with Neptune in your angle of income and resources, things could go one of two ways. Either you receive news of an unexpected bonus or gift or your finances spring a leak. Better to be safe than sorry and double check your outgoings and spending patterns to identify how you can make them more watertight. With the Sun in your communication zone at odds with reality planets Saturn and Pluto at the end of the week, there may be demands, challenges or power plays, so far better to deal with it once and for all before the doozy of a Full Moon arrives on April 19th. From then on, opportunities to expand your horizons will arrive thick and fast. On Wednesday 10th first Jupiter slows to turn backwards at the pinnacle of your chart then Venus meets Neptune in your own sign. Since late last year, Jupiter has been bringing opportunities to shine and has expanded your career in ways you never thought possible. Don’t worry about going back over old ground until August as this is when you will uncover offers and possibilities that somehow passed you by at the time. Someone may come back around to make you an offer you can’t refuse. Or you might even find that you’re done with your current field and branch out into something more appealing. Take your time and don’t grab the first shiny thing you see. What is for you never goes by you. You can pick up Lorna’s e-book “Bringing Your Astrology into the 21st Century: The 5D Planets” here. ‹ PreviousTransformation of the Global Monetary Central Banking System, R.I.P.